Grandmother Ruth took great delight in reading to Glenn Curtiss when he was a very young child. They were both particularly delighted by the antics related in Darius Green and His Flying Machine, a zany poem that poked fun at people’s attempts to fly. The idea that people could move really fast, or maybe even fly, captured his youthful imagination. Glenn’s first attempt to go faster than anyone else was perhaps when he rigged a sail to a bamboo fishing pole, strapped on his ice skates, and flew around frozen Keuka Lake, just down the hill from his home in Hammondsport, NY. His invention made him the fastest skater in town. Glenn’s attributes attracted the attention of local businessman, James H. Smellie, a pharmacist who had a bicycle shop and salesroom on the side. He gave Glenn with a yellow Sterns racing bike that Glenn raced in regional competitions. His long, muscular legs and love of speed generally assured him the first place trophy. Smellie was so delighted by the business Glenn brought to his shop that he offered him a job. 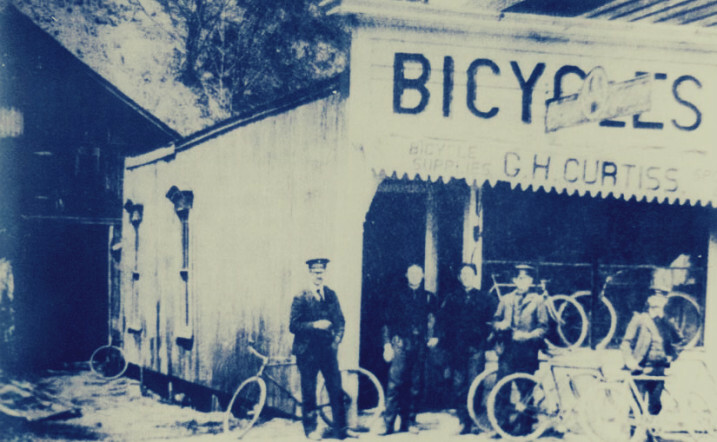 Within two years, Glenn had his own bicycle shop and opened two others shortly thereafter. It wasn’t long before Glenn felt the need to go even faster, so he assembled a small engine from parts that were advertised in Scientific American. You can only imagine the stir it created around town when he strapped the engine to one of his bikes! When he was ready to test it, word spread quickly about town; people gathered as he circled around the town center. Coming off the circle, he was suddenly stricken with an overwhelming desire for more speed. He really opened it up and was heading toward Keuka Lake when he realized that he had not installed a braking system. He had the choice of a lake dunking for him and the bike or a collision with a tree – he chose the tree. Glenn’s encounter with the tree marked a turning point in his life. He abandoned bicycles and rode only in motorcycle races from there on, and converted his shops to motorcycle shops. The business and race competitions were tougher, and the only way to stay on top of both was to go faster with a better engine. After some research, he concluded that he could make a better engine than could be bought anywhere else, which is considered to be the single most critical decision of his life. Glenn got to work. His second engine weighed 190 pounds with a bore of 3.5 inches and a stroke of 5 inches. It’s cumbersome by today’s standards, but the engine reached a then-unbelievable speed of 30 miles per hour and was capable of climbing the steepest hills around town. He further refined the engine and came up with engine #3, which became the production model for his then booming motorcycle business. Glenn became the talk of the town with each success on the racetrack and Hammondsport’s social life revolved around the Curtiss Manufacturing Company. He was single-handedly responsible for putting the sleepy little town of Hammondsport on the map. A truly unusual feat for a man who relished his privacy!